The smell of black powder and cordite. The momentary blinding of a muzzle flash. The deafening roar of a close-quarter shot. Forget the movies; true shooting is exciting enough for a thousand stories – if you live long enough to tell the tale. New gear for gun enthusiasts. 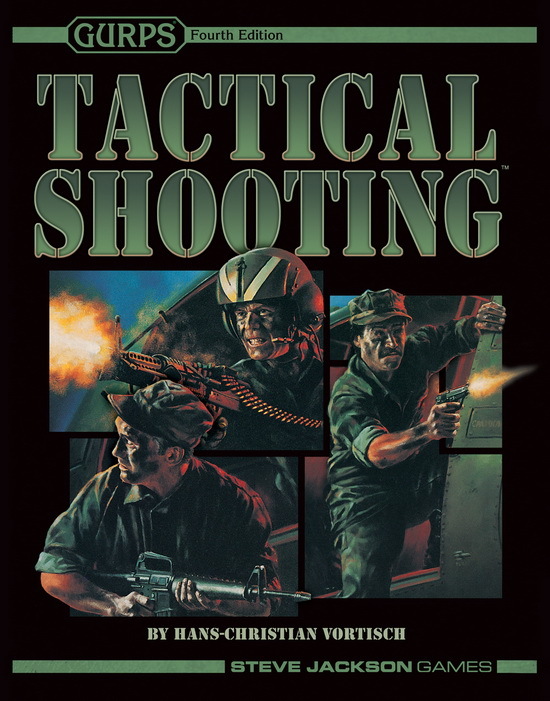 Expanding and augmenting the equipment from GURPS High-Tech with more than 30 new gun-related items and options, including tripods, slings, sights, and camouflage – all designed to give the shooter a realistic advantage. This supplement builds off the foundation laid by GURPS High-Tech. It's guns, gear, and more from TL5 to TL8. For rules and information on cinematic gunplay, slide across a marble floor with two guns a-blazing and check out GURPS Gun Fu. GURPS SEALs in Vietnam contains templates, vehicle lists, and equipment for the U.S. Navy's elite warriors during that conflict. Check out GURPS Martial Arts: Fairbairn Close Combat Systems for more information about a modern combat style. More background and stats for real firearms from the early 20th century are contained in GURPS High-Tech: Pulp Guns 1 and GURPS High-Tech: Pulp Guns 2. To expand Tactical Shooting to TL9 and beyond, check out Hans-Christian Vortisch's "Tactical Shooting: Tomorrow" from Pyramid #3/55: Military Sci-Fi. Take on the monsters with Hans-Christian Vortisch's "Tactical Shooting: Monster Hunters" from Pyramid #3/73: Monster Hunters II. For a second-by-second breakdown of real and cinematic Western shootouts using the Tactical Shooting rules, see Pyramid #3/74: Wild West for "Famous Wild West Gunfights," written by Hans-Christian Vortisch. For alternate rules on aiming (perfect for folks using Tactical Shooting), check out Pyramid #3/77: Combat. Discover more about futuristic shooting in "Training for the Tech," from Pyramid #3/85: Cutting Edge.